Regular pub goers will have noticed a surge in unfamiliar, quirky labels behind the bar over the past couple of years. The surge in popularity of craft beer has even been recognised by the government, which introduced tax breaks in this year’s Budget for micro-breweries like Eight Degrees Brewing, Mountain Man, and Wicklow Brewery. 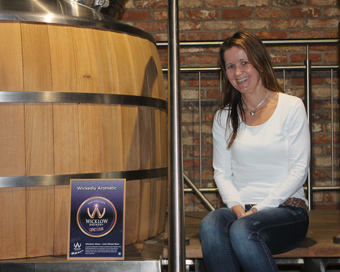 Leigh Williams and her husband Ashley, run the Wicklow Brewery along with their pub and restaurant Mickey Finns, and a glamping operation. The business was set up by Ashley’s parents, who recognised an opportunity to make extra income on their family farm with a holiday park on the side. “I studied marketing at the Marketing Institute of Ireland and I worked for Trailfinders, sending people out of Ireland, whereas now I’m trying to get them to stay!” Leigh explains. The experience in tourism was valuable, and when they noticed a trend in people coming to the pub seeking local beers, they spotted an opportunity. The more they looked into craft beer, the more it appeared to be really taking off, she says, and they only began brewing in order to satisfy that tourist demand in their own bar. However, “the baby turned into a monster”, jokes Leigh, and now Wicklow Brewery beers are available throughout Wicklow, Wexford and Co. Dublin. Leigh and Ashley are not home brewers themselves, and recruited a master brewer from Bavaria. There has been so much demand for their product, Leigh says, that they are about to take on an apprentice; a rare opportunity for an aspiring young Irish brewer. Now, the tiny village of Red Cross is on the map thanks to busloads of tourists who visit the brewery where Bavarian Master Brewer Mathis works his magic, and stick around to sample the fruits of his labour along with matching dishes in the adjoining restaurant, and “hooleys” in the Bierhalle. When WMB speaks to Leigh she is fresh from the Alltech festival, where she says there are so many breweries popping up and producing quality beer that there is a beer now for almost every locale in the country. The market share of craft beer is currently less than 1.5 percent in Ireland, but Leigh points to the example of Colorado, where she has family, where it’s ten percent. “It will get to a point where it’ll flatten out, probably at around ten percent,” she says. At events like the Alltech festival and the Ploughing Championships, where they also exhibited, she says it was clear that the market is expanding, with a lot of women beginning to drink beer. The Wicklow Brewery was opened by Fine Gael TD Andrew Doyle, and from the measures taken in the budget, it’s clear that the sector’s potential for job creation, particularly in rural areas, is not being overlooked. A relief (originally introduced in 2005) that reduces the standard rate of Alcohol Products Tax by 50 percent on beers produced in micro-breweries producing not more than 20,000 hectolitres per annum has been extended to apply to micro- breweries which produce not more than 30,000 hectolitres per annum. Keep an eye out for the craft beer invasion near you – the Williams family will soon be getting their 10 percent market share!